Select the answer below which best suits how you act at parties and social gatherings. Select your favorite food from the list below. Select your preffered location to spend an afternoon off. Select the activity below which sounds most appealing to you. What are your sleeping patterns like? An intruder breaks into your home: How do you handle the situation? An ancient shark bigger than anything which exists in the ocean today. Perhaps you have a larger than life personality as well. The quick-tempered Kraken is released by anyone with a vendetta that controls it. Perhaps this is how people in your life see you. 8 arms and a highly developed brain. You are just like the giant octopus: an intelligent person capable of juggling many responsibilities. Reclusive and mysterious, you are just the Lochness Monster. A Siren is an evil type of mermaid. You perhaps share in the Siren's love of music and deception. 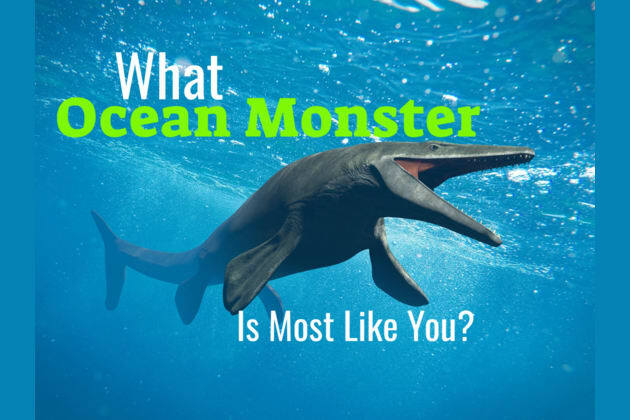 Deep in the ocean, there is a mysterious monster who you share a personality with. Which monster it is says much about your personality. Answer these questions to find your spirit creation of the ocean.